This is a multifunctional USB charging station, you can charge all version of the i-watch(38mm and 42mm sizes), i-phone(7/7plus/6s/6sPlus/6/6Plus/5s) or most smartphones at the same time with it. It is built in 3 safe powered USB ports, each port will intelligently identify your device at highest speed with the smart IC installed. You can charge the i-watch(38mm and 42mm sizes) and i-phone or most smartphones at the same time with 3 USB ports. Built in 3 safe powered USB ports enable you to rapidly charge your tablet, i-phone, Android and smart phones simultaneously at any time. 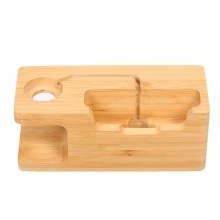 This charger is made of natural bamboo wood, eco-friendly. The surface of stand is sleek and it is a perfect place to keep your devices safe and clean. Small size and portable, easy and convenient to carry.